There are several change management models and thoeries for todays business world to follow. Many of them are simarlar and some are different. In my opinion there is only one change management model that covers all the bases. With that being said Kotters guide to the change management process is still the choosen choice for many leaders. Harvard Proffessor and highly recommended Author John Kotter wrote the incredible popular book titled "Leading Change". Kotter litterly provides a roadmap of how to go about acheiving orgainzational change no matter what size it may be. Through his 8 step change management model he explains how to achive change by building on each step. He also discusses how to be aware of possible roadblocks that could ultimately hurt the change management process. This stage is all about motivating the workplace to consider change and get them to buy into it. The hard part here is that people don't generally like the idea of change to start with. For change to happen it has to be believed by at least 75% of management that change is good. So how do you actually create an urgency for change. Start developing conversations about whats happening in the marketplace and what your competition is doing. Create the buzz of what will happen if we also don't change. In order to move to step 2 you need that 75% of strong support. If you do move on to soon you will risk further short term loses. In short, be paitent and do not force things just keep creating a buzz. 1. Recognize and develop the negative effects of avoiding change. 2. Develop new business opportunites. 3. Communications sholud be open, honest and persasive. 4. Build outside support from customers, investors, etc. Here in step 2 you will continue to promote the power of change and the reasons for it. Doing this alone is simply to much of a difficult task. 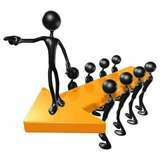 Search out strong leaders thoughout the organization that are liked and respected. Leaders that have differences in expertise and background. Build a team that has variety and balance. When your coalation team is complete. Make sure that everyone is on the same page and continue to build urgency for change. Keep in mind that there are other change management models and change management thoeries out there. Make sure that the change team knows which one you are following to avoid problems. 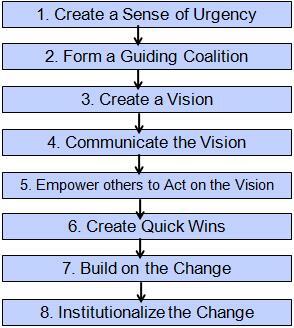 Most change management models have some type of vision strategy and John Kotters 8 step plan is no different. When people think about changes or improving things many ideas come to mind. Work with the change team for ideas for strategy and vision. If you put together a strong team you will find a lot of execllent ideas to choose form. Develop the best ones that will provide vision that everyone will understand and remember. 1. Solid understanding of what are the organizations values. 4. Determine that coalition can explain the vision in under five minutes. 5. Constant review and practice of your vision speech. With vision in hand, clearly begin to communicate it to the entire organization. Frequently speak of it with passion and incorporate it in everything you do. This will allow you to consitently focus on the improved vision of change. Use it daily to make decisions and solve problems. Whenever an opportunity presents it self talk about. It's all about keeping it fresh in the minds of people. Be passionate about it and walk the talk. Actions are more important and believable then what you say. You will build creditability and will be taken seriously. 4. Be open and honest when addressing others conerns. The first four steps involved managing change in the workplace by building urgency combined with the vision of change. This is the step were you can start to acheive the beneifits from your vision of change. If everything was done correctly then your staff and team should be properly motivated and ready accept change. This step also includes removing obstacles. These obstacles may include people and even processess or structures. Install the structure for change and moniter it regularly for issues. 2. Gain consistent feedback, recognize and reward people for making change happen. 3. Enusre compatiability of organizational structures, performance, and compensation systems with the vision of change. All change management models are set up diffently. But Kotter has put together the first five steps as a guide to change management. The remaining steps will start to provide results that will lead to change. When a group or individual go through a process that deals with change there needs to be some early on success. This success will motivate the group and carry them foward. These results need to be seen by your staff. If no success is seen then you open the door to negative thinkers and critics. Have your change team create short term wins that include very small changes. This will allow the people to taste some success. 1. Implement only small changes that will not open you up critcs. 2. Choose cost effective targets that can be easliy obtained. 3. Completely analyize targets to avoid failure. Use pros and cons to determine early target success. 4. Recognize the people who help you meet the targets through rewards. Kotter claims that many organizations fail due to declaring victory to early. Real long lasting change is not automatic and still has to be developed. For change to be sustainable and long lasting it requires persistance and patience. 1. After achieving targets, analyze what worked and what didn't. 2. Develope new goals to maintain and continue strong growth. 3. Learn about Kaizen, the idea of continuous improvement. The final stage requires continuous efforts to ensure that the change is seen in every aspect of your organization. Continuous efforts will also confirm that the changes are working and on track. Integrate new values within the organizational culture, recognize and promote supporters, and hiring new employees. 1. Keep talking about progress every chance you get. Tell success stories about the change process, and repeat other stories you hear. 2. Explain the importance of change ideals and values when hiring and training. 3. Develop new policies and processes that reinforces the values of change. John Kotter and others have provided change management models that successfully work. Its a matter of prefrence for which one you choose to use. I sugeest that you review a few different change management models before you decide. I personnely like the depth and detail that kotter discusses. I am a firm believer that managing change in the workplace as well as employee motivation is an ongoing progress. Important note before you embark on any change management model. Understand the four steps that leads to successful management of change.